As Executive Leader for D.A. Davidson Companies Community Relations, I am proud to share the 2017 giving report with you and the many stories of our generous associates’ community involvement. At D.A. Davidson, we are as committed to working on behalf of our local communities as we are to serving our clients, and each year we highlight our philanthropic- and volunteer-oriented approach as part of our strategic plan and core values. In 2017 we were proud to launch D.A. 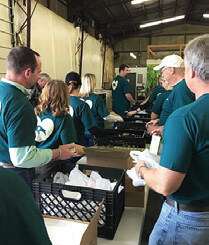 Davidson Day, an annual event that enables our associates to come together and more easily serve those in need. While this event represents our largest collective volunteer initiative to date, our company has a long history of giving back. It’s the D.A. Davidson way. Just as we work to improve our clients’ financial well-being, D.A. Davidson Companies also works to strengthen local communities. We donate to a broad spectrum of worthy organizations and causes, with the goal of improving lives while bringing hope and comfort to those who need it most. Each year we designate a significant portion of our company’s pre-tax profits to supporting nonprofit organizations. We believe we can create the most impact by focusing our giving in three specific areas that reflect the needs in our communities. We have long invested in, and encouraged associate involvement in, our local communities. In addition to advocating for volunteerism, we believe in taking our commitment further — enhancing our employees’ generosity by matching their gifts to eligible organizations. When our company has as much “skin in the game” as our professionals do, we can amplify their donations to the causes that matter the most to them. Under D.A. Davidson’s gift matching program, we match donations of volunteer hours or cash contributions for each of our associates. Hundreds of individuals took advantage of the program during fiscal 2017. We are already anticipating our associates’ enthusiastic involvement in the coming year and are thus increasing the total dollars available for gift matching, to ensure that our financial backing is as generous as our employees. When we say we are invested in education, we stand by our words. Our Student Investment Program offers students a firsthand experience in the areas of finance, portfolio management, stock research and leadership. Each year since 1985, we have given $50,000 to college and university student teams to invest in the stock market, for a $1 million annual commitment. The students make investing decisions with the guidance of a local D.A. Davidson financial advisor, and manage the portfolio for a full year, allowing for a longer-term perspective on investing that we believe amounts to a lasting education. The Student Investment Program also offers a lesson in profit sharing. As part of our commitment to the institutions involved, D.A. Davidson absorbs any portfolio losses and the colleges earn half of their team’s portfolio gains above 5 percent. In a year of strong returns like 2017, that amounted to significant donations to several of the 20 schools in the program. In the 23 years since D.A. Davidson began sharing program profits, the company has donated $552,900 to participating institutions. While the payout is a nice bonus for the schools, we believe the program’s real value lies in its hands-on approach. For those who aspire to a career in financial services, a chance to test their investing mettle can be priceless. We all benefit when our communities become stronger, safer and more interesting as a result of the efforts of concerned and committed citizens. The Bragg Lewis Knutson Community Service Award celebrates associates’ generosity and compassion as expressed through their service to community. This award recognizes an individual whose long-sustained volunteer efforts embody the spirit of giving and whose dedication has made a positive impact in the lives of others. Tom’s remarkable commitment to social responsibility and volunteer work can be seen in the positive change he has helped bring about in his community and beyond. 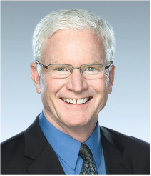 Tom was a founding board member for two major nonprofit organizations, Community Cancer Services and Panhandle Alliance for Education, and helped drive the development and success of both groups. He serves as an emeritus board member for Panhandle Alliance for Education and was instrumental in establishing its endowment, which has awarded more than $1 million in innovation grants for teachers. Tom also donates his time to teach martial arts, with the goal of encouraging confidence, discipline, physical abilities and coping skills. He has been an active Rotary Club member for 22 years and has served in leadership roles with two different clubs. In 2009, Tom earned the Ian B. Davidson Cultural Excellence Award and is the first D.A. Davidson associate to have received both of the company’s most prestigious awards. 2017 marked the beginning of a D.A. Davidson annual tradition — our company-wide day of giving. On D.A. Davidson Day, associates across the nation came together to serve their communities and actively live our core value of caring. 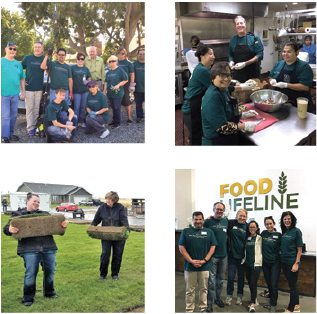 The event involved a week of collaborative service opportunities so that multiple locations and diverse employee interests and organizations could be served. Local D.A. Davidson associates nominated and selected the nonprofit groups, which represented a mix of organizations that included animal shelters, senior services, food banks, and programs for the homeless and youth, among others. 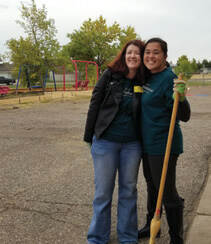 Each volunteer wore a green D.A. Davidson Day t-shirt showing the firm’s logo inside a heart — a symbolic reminder of the caring aspect of their service. At a company known for its focus on social responsibility and philanthropy, this new event represents a strong addition to our already-long list of programs and initiatives that benefit nonprofits. We are looking forward to celebrating D.A. Davidson Day every year and to continuing our year-round good works. 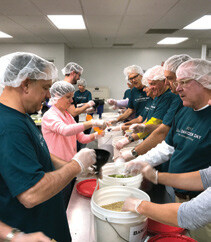 Our Utah associates worked together to assemble more than 200 soup kits to be sold to help feed those in need. In addition to participating in this important annual fundraiser, they also made a generous donation. 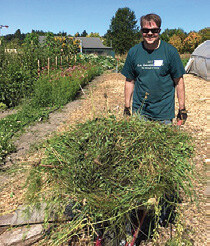 Soaking up the last few rays of summer sunshine, Seattle associates united to garden, beautify and prepare a local youth farm for winter. Others volunteered at a college arboretum that serves as an outdoor classroom and garden sanctuary for the Seattle community. 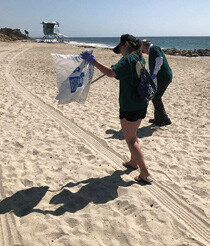 Teaming up for California Coastal Cleanup Day, Carlsbad associates made a satisfying impact on their surroundings. As firm believers of maintaining a safe environment for families to enjoy nature, they were proud to donate their time in support of an organization that serves as a voice for clean water and healthy communities. Despite rainy weather, associates in Great Falls remained upbeat while completing various home improvement projects with the goal of advancing declining neighborhoods. 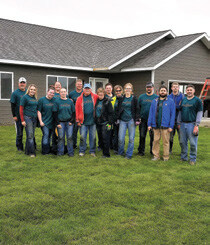 In just two hours, they efficiently laid 10,000 square feet of sod and helped to spruce up the interior of several houses. A team that cooks together, stays together. 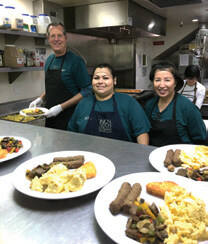 Associates in California helped out with breakfast prep at a local homeless shelter. Columbus associates worked together to repair several Little Free Library boxes and freshen up the boxes with a coat of new paint. With a firm belief that no one should go hungry, our Helena branch has been a longtime supporter of Helena Food Share. For D.A. Davidson Day, the group put together 1,000 “kid packs” — filled with healthy snacks — to help ensure that elementary school students have enough nourishment during weekends, when school lunch programs aren’t available. Great Falls associates cleaned and repainted the playground of a nearby preschool. By sharing their time, they were reminded that having positive role models growing up helps shape the leaders of the future — our children. For maximum impact, our Lewiston office split its work among two distinct areas with the Boys & Girls Clubs of the Lewis Clark Valley. Several members of our team created sandwiches that were part of an after-school snack for club participants, while other associates focused on kindergarten class instruction. At D.A. Davidson, we believe not in just voting with our feet but also with our arms and legs — sweating for a cause by enjoying physical activity while we support our favorite nonprofit organizations. In 2017, a number of our offices and departments walked, danced, cycled, ran, golfed or even climbed stairs to raise funds for important causes. In Spokane, a team of associates donned D.A. Davidson t-shirts, headed to a local gym and sweated to music while riding stationary bikes. Their workout was part of the annual Pedal for a Purpose event, which raised money for the yearly campaign supporting the YMCA of the Inland Northwest. In Omaha, a large team of D.A. Davidson associates celebrated their 16th year of raising funds for JDRF, a global organization battling type 1 diabetes. The team dubbed itself “Robyn’s Heroes,” named for the daughter of an employee who is living with juvenile diabetes, and were proud to walk for a cure. A team in Los Angeles also took a fundraising walk, with a more vertical approach. For a third year in a row, members of our L.A. office hiked up 1,664 steps, or 75 stories of the US Bank Tower, for the annual Stair Climb for Los Angeles. Their workout benefited the Ketchum-Downtown YMCA, a longtime favorite beneficiary. In many of the 26 states where we operate, groups took to the links to enjoy golf outings while raising funds for their respective causes. Because we cannot think of anything more rewarding than making a difference while having fun. When we consider areas where our donations can have the strongest impact, we believe humanitarian aid is among the most important. In 2017, we worked to provide emergency aid at a time when many Americans were reeling from the hurricanes and wildfires that swept through several states. We harnessed our collective efforts so that our associates could donate and be assured of a company matching donation, adding extra funding power at a time when our friends and neighbors needed assistance the most. Because we wanted our gifts to go to basic necessities — food, clothing, shelter and emergency supplies — we turned to the American Red Cross as a partner that could make sure our donations would reach the right places quickly. Together with our employees, we provided monetary donations to fund relief efforts following Hurricane Harvey, the costliest and most devastating tropical cyclone on record. When our associates learned of summer wildfires roaring across Montana that scorched more than 1 million acres, they suggested that we add funding for wildfire relief. By the end of the summer, our employees had donated to the Red Cross to help Montanans hurt by the wildfires and also provided funds for the separate Montana Wildfire Relief Fund. Humanitarian aid isn’t just about major disasters, however. At our company headquarters and some other locations, a number of dedicated associates have been quietly giving of themselves to save lives every year. They roll up their sleeves several times a year to provide the Red Cross with one of its most important resources: blood. At our headquarters location, a dedicated group of associates is credited with providing more than 1,380 units of life-saving blood in the last 15 years. Working with the University of Montana, we were able to take our investments in education to new heights. When the UM Business College suggested adding a D.A. Davidson-sponsored ticker tape above its main stairwell, our answer was a resounding “yes.” As longstanding partners for various projects with the university, we were delighted to have our name associated with the school again. The electronic ticker tape provides a stream of important information, including stock prices, to Business College students. It also serves as a reminder that D.A. Davidson is a potential employer for the college’s graduates, with opportunities in cities across the U.S.
Our Seattle colleagues have taken a more hands-on approach to investing in education, with a younger audience. D.A. Davidson professionals served as volunteer tutors for Invest in Youth, a program known for its powerful effect on struggling learners. 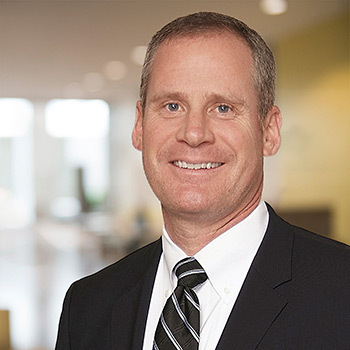 The firm has been a longtime investor in the program, which matches volunteer mentors with students for at least one year. The result is a meaningful relationship for both. Margaret is just one of the many D.A. Davidson professionals who have tutored students with Invest in Youth over a number of years, working at the five Seattle schools that participate. Another senior advisor tutored for one year and then continued to volunteer by teaching a four-part Financial Beginnings course as part of the program — offering a basic financial education to students at one of the participating schools. D.A. Davidson has also provided financial support to the program for a number of years.